The voice inside my head is a redneck. 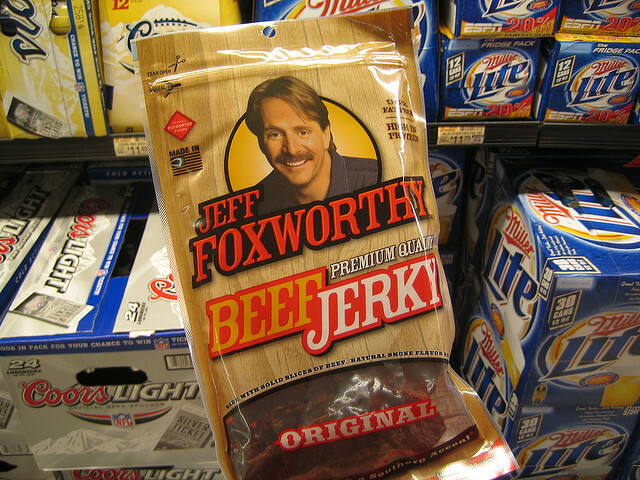 Actually, I think it’s Jeff Foxworthy, who may not really be a redneck even though he likes to define them. But, let’s get back to that voice. Yes, I do. But I am not hearing the voice you’re hearing – the one that gets you sent to the mental hospital. It’s that Jiminy Cricket, conscience voice. Not some kind of God-is-ordering-me-to-blow-something-up voice. Just a plain old inner voice trying to guide me in my daily life. Only it’s never had such a distinct accent. In fact, it’s always kind of sounded just like me. Just more judgmental. But, a couple of days ago, I noticed a change. And, I swear, it was Jeff Foxworthy. Coincidentally, I was downloading free Easter fonts the other day (bear with me – this is relevant), opened my browser, and suddenly was reading everything in “Bunnyhop”. It’s hard to take CNN seriously in a Bunnyhop font. I deleted the font, and everything was back to normal. So, I’m wondering, did I somehow accidentally download Jeff Foxworthy’s voice into my conscience? I don’t even watch or listen to Jeff Foxworthy. I’m pretty sure it has something to do with giving up Diet Coke. Posted on March 21, 2012, in Annoyances, Humor and tagged beef jerky, conscience, humor, Jeff Foxworthy, jiminy cricket, redneck. Bookmark the permalink. 29 Comments. I’m not sure what my inner voice sounds like…maybe a really proper grammar teacher…anyway, Foxworthy might be fun to have in your head. As far as the diet coke goes, I only had that one drink I told you about, but other than that, it’s been water, so are we still “tortured together” pals? Also, when does this thing end…that Mountain Dew still laughs at me from the fridge every day. I think you have enough things to torture you, so yes we are still tortured together pals. I think you should drink the Mountain Dew. I’ll probably be able to hold out until something really dire happens. Um, what other things are you referring to? I’m going to hold out on the Mountain Dew…it doesn’t think I can. Could be worse. Could be Larry the Cable Guy. Thanks. Now I have two redneck voices in my head. I have decided to send you a box of diet coke! Maybe I should adjust my vow to not include freely offered Diet Coke. You only have one inner voice? Not anymore – thanks to Guap. I am sure you would find him quite tasty, Bassa! That is an interesting thought. Who is a lovable, stubborn, vengeful person who could be egging my do on? Can you imagine if the voice in your head was Gilbert Gottfried? Great. Guap gave me an extra voice already, and now they are both yelling at me. We can hear Jeff Foxworthy speaking. Maybe it is contagious? Are you sure it’s not coming from the television set? It went away after 24 hours. Maybe it was the TV? Was the T.V. on? Or plugged in? Oh, and it doesn’t count if the T.V. is plugged in but you chewed through the cord. My inner voice sounds like a lot of different people depending on my mood. No, I’m not crazy! Wow. And you’re young. Usually voices don’t split into different personalities until you’re over 40. At least that’s what Jeff Foxworthy tells me. Larry would be a welcome respite from Jeff.